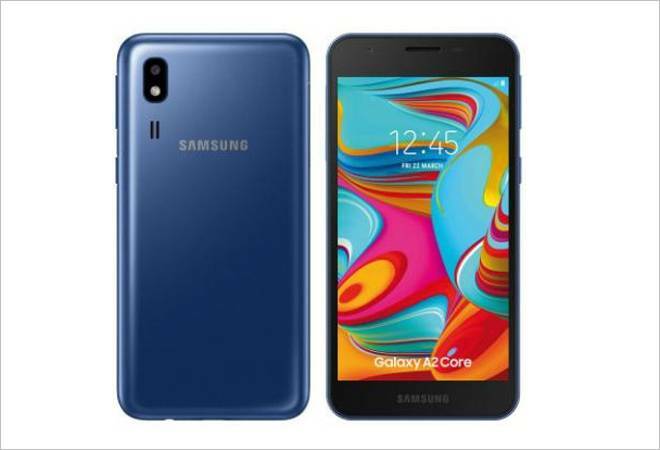 Samsung has launched its Android Go smartphone called Samsung Galaxy A2 Core to take on Xiaomi's Redmi Go. The Galaxy A2 Core runs on Android Pie (Go Edition) and is the successor to Samsung Galaxy J2 Core, which was codenamed as SM-J260. The Galaxy A2 Core is priced higher than the Xiaomi Redmi Go at Rs 5,290. Xiaomi's Redmi Go is priced at Rs 4,499. "We are going to ship out Galaxy A2 core this week at Rs 5,290. This is going to be a tremendous boost to people who want to switch from feature phones to smartphones. This is going to be huge in terms of volume," Ranjivjit Singh, Chief Marketing Officer and Senior Vice President, Samsung India said. As far as specifications are concerned, Galaxy A2 Core has a 5-inch LCD with a qHD (960x540 pixels) display. The smartphone is powered by the octa-core Exynos 7870 SoC paired with just 1GB of RAM and 16GB of internal storage. The dimensions of Samsung Galaxy A2 Core are 141.6x71x9.1mm and it weighs 142 grams. The phone draws power from a 2,600mAh battery, which is slightly smaller than the one in Redmi Go (3000 mAh). Since the device runs Android Pie (Go Edition), it will come pre-installed with a host of Android Go-optimised apps like Google Go, YouTube Go, Gmail Go, Assistant Go, Maps Go, Chrome browser, Facebook Lite, FM Radio, File Manager, Calendar, Calculator and more. The Android Pie (Go Edition) is a trimmed down version of the power-hungry OS, which is designed to work flawlessly with limited memory and processing power. Meanwhile, as per the leaked user manual, the Samsung Galaxy A2 Core will come with both single-SIM and dual-SIM variants, but it is not clear which version has made it to the Indian market. Going by the usage pattern of Indian consumers, the dual-SIM variant will surely make its way into the country. Lastly, the optics of Samsung Galaxy A2 Core will be at best satisfactory. The smartphone comes equipped with a single 5-MP rear camera as well as a 5-MP front camera. In comparison, Redmi Go houses an 8-MP camera with flash and HDR. The camera application is neat with photo, video, square and manual mode. The front camera of Redmi Go also has the AI Beautify feature.